Immunogen: Synthetic peptide corresponding to the sequence near the C-terminus of human GSK-3β. Application Notes: Detects a band of ~47kDa by Western blot. Scientific Background: Glycogen Synthase Kinase 3β (GSK-3β) is a unique serine/threonine kinase that is inactivated by phosphorylation. In response to insulin binding, PKB/AKT phosphorylates GSK-3β on serine 9, which prevents GSK-3β from phosphorylating glycogen synthase. Unphosphorylated glycogen synthase is active and able to synthesize glycogen. GSK-3β is also unique in that it requires a substrate that has been phosphorylated by a distinct kinase before it can phosphorylate the substrate. This phosphate priming mechanism explains why phosphorylation of serine 9 inactivates GSK-3β. The phosphorylated serine binds to the GSK-3β priming phosphate position and prevents binding of alternative substrates. In addition to insulin signaling, GSK-3β participates in the Wnt signaling pathway, where it forms a complex with axin, beta-catenin and adenomatous polyposis coli (APC) protein. In the presence of Wnts, GSK-3β is unable to phosphorylate beta-catenin, which leads to stabilization of beta-catenin. The Wnt pathway inactivates GSK-3β via the proteins, Dishevelled and FRAT, which disrupt the interaction of GSK-3β with axin, beta-catenin, and APC. Clinically, there is considerable interest in GSK-3β inhibitors because they may mimic the effect of insulin or reduce the hyperphosphorylation of Tau that is observed in Alzheimer's Disease. 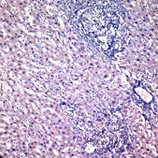 Immunohistochemistry analysis of human hepatoma tissue with GSK3β pAb. Western blot analysis of GSK3β pAb. Lane 1: MW marker; Lane 2: HeLa; Lane 3: Jurkat; Lane 4: 3T3; Lane 5: PC-12; Lane 6: MDBK.